Deep conditioning and TLC in just 15 minutes! 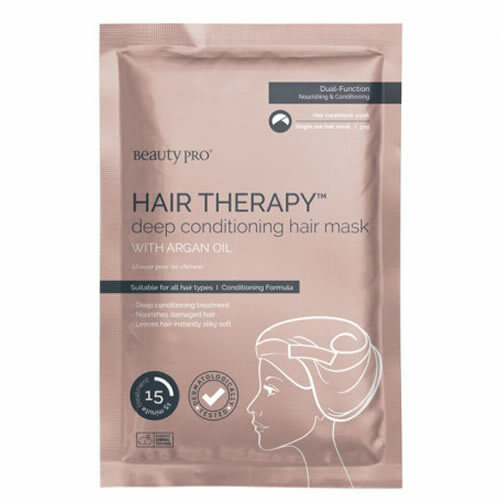 Beauty Pro HAIR THERAPY Deep Conditioning Hair Mask is enriched with argan oil and jojoba seed oil which combine to revitalise dry, frizzy and damaged hair. The hair sheet mask locks in heat to ensure that the ingredients are able to penetrate deeply into your clients' hair. Damaged hair is intensely nourished and is left silky smooth by a process that takes just 15 minutes to do its job! It's suitable for all hair types and has been dermatalogically tested. £5.34 (inc. VAT) Why no VAT? We're a trade wholesaler and quote our prices without VAT to help our VAT-registered customers understand the true cost of a purchase. Age-defying, collagen-infused facial sheet masks that make facials quick and easy with great results in just 15 minutes. Choose from Brightening with Vitamin C, Rejuvenating with Green Tea Extract or Nourishing with Olive Extract. A deep cleansing, self-foaming mask that uses Activated Charcoal and a rich AHA complex to improve skin clarity, tone and elasticity. Perfect treatment for acne-prone skin in particular.